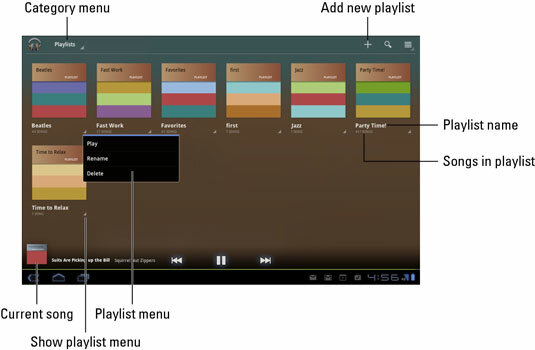 The Samsung Galaxy Tab Music app allows you to categorize your music by playlists. Yet, sometimes you want to change the songs on these playlists or remove music from your Galaxy Tab altogether. Both of these are possible on your Galaxy Tab. Any playlists you’ve already created, or that have been preset on the Tab, appear in the Playlists category, which you can choose from the Category menu in Music app. Any playlists you’ve created are displayed on the screen. To see which songs are in a playlist, touch the playlist album icon. To play the songs in the playlist, touch the first song in the list. Or you can choose the Play command from the playlist’s menu. A playlist is a helpful way to organize music when a song’s information may not have been completely imported into the Galaxy Tab. For example, if you have a lot of songs labeled Unknown, a quick way to identify those songs is to name a playlist after the artist and then add those unknown songs to the playlist. Locate the music that offends you. You can choose any music category except Playlist; deleting music from a playlist doesn’t permanently remove it from the Tab. Touch the menu triangle button by the song. Or you can choose the menu triangle button by an artist, album, or just about any other category in the Music app. The music is gone. La, la, la, la: The music is gone. The music is deleted permanently from the Galaxy Tab’s internal storage. By deleting music, you free up a modicum of storage space, though you can’t recover any music you delete. If you want the song back, you have to reinstall it, sync it, or buy it again.